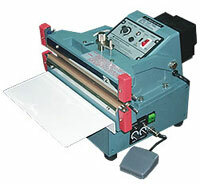 A single/double automatic heat sealer is a great heat sealer for closing thick bags. 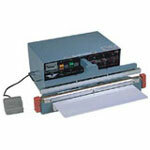 The heat sealer has 2 wires, one in the upper jaw and one in the lower jaw. If you are sealing a really thick bag you can turn on both wires to generate enough heat to seal the bag. If you then need to close thinner bags you flip a switch and only one element heats up. This way you do not melt your thinner bags. 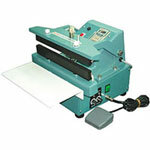 This automatic impulse heat sealer is very versatile for sealing a spectrum of bags. 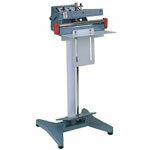 Because these machines can be purchased in 5mm or 10mm wire you can really tackle a heavy bag. Please let us know if you have questions about this product. It is always best if you have a very thick bag to send us a sample to test. 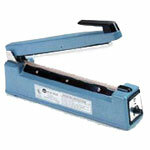 At Boatman Marking we have a range of heat sealers and impulse heat sealers for all your applications.